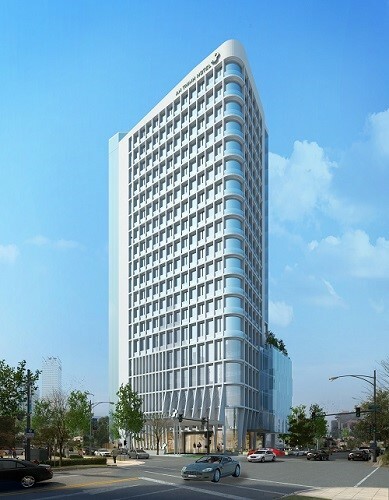 In order to meet the requirement of promoting communication strategy for a local village in both domestic and international, the construction of 5-star Wyndham Garden Hanoi Hotel is being built in Van Phuc Silk Village, becoming the main point for Ha Dong District area in particular and the whole Western area of Hanoi in general. The project is constructed on HH-01 Plot, which is an urban area has been built up the infrastructure, modern surrounding architectural elements. Therefore, the construction of 5-star Wyndham Garden Hanoi Hotel is full of characteristic including performance, convenience in use, modern in appearance to ensure high integration with the surround buildings. The scale of project will include 19-storey blocks, one basement and one technical floor, with the building area of 713 m2 and total expected floor area is 10,704 m2, are arranged according to functional use including hotel, restaurant, bar, reception area, fitness area, accommodations… based on an international standard. The investor, P&P Construction Investment JSC has wisely selected the prestigious contractors to implement the project. With more than 12 years of experience in providing M&E services for hotel and apartment project, Sigma honored to become the Main M&E Contractor since 13/03/2017. We trust that with our ability, Sigma could afford to work closely with the investor and design consultancy to comply with international rigorous standards, ensuring environmental factors, safety and health.